When they first announced plans for Major League Fishing, I think my reaction was probably similar to that of many anglers. Really? Do we really need another tournament circuit, especially one with hand picked pros and features cobbled together from past made-for-television events? Haven’t we suffered enough? Dodging any number of pitfalls, it seems that Major League Fishing just might live up to its name. The program still needs some fine-tuning, but overall the concept seems to be working. It also seems that we have moved on from the era when bass pros felt compelled to act like total buffoons. There’s still some of that in Major League to be sure, except now it looks more like contrived lameness than manufactured stupidity. Are you listening Ish? Or Ike? More often, the show gives us pros talking like pros, showing their occasional frustrations and passing along some angling advice for those willing to watch and listen. While it’s still a work in progress, the editing of the show is light years ahead of other tournament broadcasts in that it keeps the excitement building without sacrificing the ebb and flow of the action. The catch-everything-you-can-over-12-inch format even overcomes the drama killing aspect of knowing everyone’s weight because no one is truly out of it. Remember when a fisherman could actually make a stirring comeback? I do. If for no other reason, this makes it worth watching. Major League also does something else that is long overdue – they make the pros treat the bass with utter respect. No bouncing and no slam dunks back into the water. Many years ago when Rubbermaid was a BASS sponsor, I pitched an idea to one of their company reps about creating a customizable rubber mat that could be placed over the cockpit floor of any bass boat so fish wouldn’t have to be dragged across hot, slime-removing carpet. Moreover, any fish that was swung onto the mat would land on a bright red Rubbermaid logo. The guy looked at me as if there was a booger on my moustache. 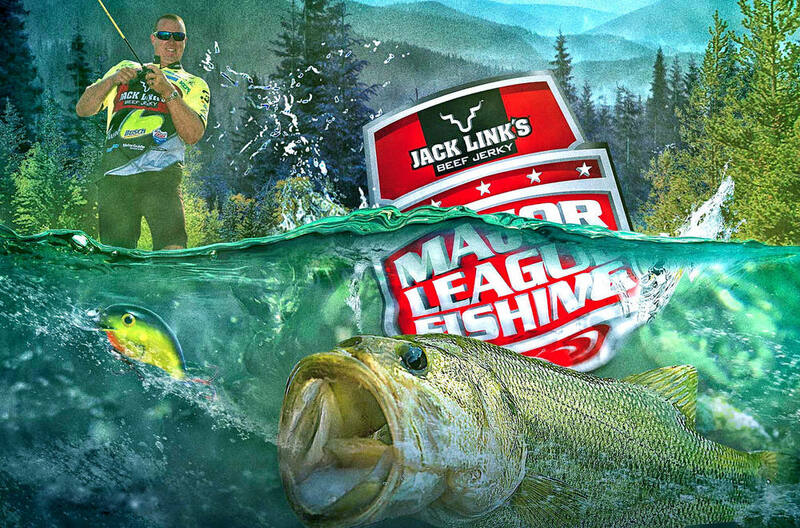 Finally, the Major League organizers did something about this most embarrassing and very real hitchhiker hanging from the lip of televised bass fishing. What the Major League television producers didn’t do should also be applauded. Somehow, someone realized that less is indeed more by not using every digital graphic at their disposal to trick up the telecasts. With a map of the lake, they tell us where the guys are fishing and, with a leader board, how they’re doing. It’s stupid simple and simply wonderful. The producers also adhere to the “less is more” philosophy by using their talking heads judiciously. Steven Scott thankfully sticks to the segment intros and Sheli Sanders does the same in recapping the weights. However, this is where my love fest ends. No matter how you slice it, Marty Stone is just wrong for this program. He is not glib, he is not insightful and he is not the guy for the job. Actually, the best thing to happen to Marty Stone this season was Shaw Grigsby being eliminated from competition. Whenever Grigsby was on camera, his casual asides showed in HD clarity how a seasoned and engaging professional handles the microphone. It was Shaw being Shaw. In comparison, Stone sounds as if he just finished off a plate of mashed potatoes with a side of Valium. Aside from his soul-deadening lack of energy, there is no there there when it comes to his analysis. Yes, I know that Major League Fishing is not designed as an informational fishing program. I get it. Still, there are questions the analyst can ask which inform the viewer and drive the drama. We get nothing of that from Stone. Perhaps chugging a 5-Hour Energy drink before his segments might help, but I doubt it. In all, Major League Fishing continues to surprise. If the decision makers resist the temptation of doing too much and accept the challenge of making changes where necessary, I can’t see any two anglers fighting over the remote control when it comes to choosing between what tournament circuit to watch. This one delivers.